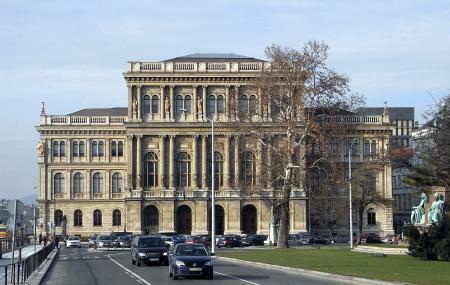 Known as the most prestigious society of Hungary, this society is beautifully placed by the banks of Danube. The history of this academy dates back to the year 1825 where a lot of money was given to research on the important topics of science and soon after a group of scholars came together to research on the topics of science. The current name of the academy was arrived upon in the year 1845. There are various sections of the academy working for different topics and also offer grants and scholarships to the deserving candidates. All and all this place is like a temple of knowledge and information. How popular is Hungarian Academy Of Sciences? People normally club together Egyetemi Templom and German Occupation Memorial while planning their visit to Hungarian Academy Of Sciences. My parents were hurt and killed for us children because we were related to Andre Citroen, and other famous Jewish scientists. They laundered us around until we were put into an orphanage in szekelykeresztur transylvania, an place filled with other kids just like us. They hurt kids and reeducation took place until no one remembered that they had parents and that they come from Jews. I remember Klausenburg and having a family when I was about 6. I remember my terrified grandma burning my sister's hand in terror so I would know her later in life if I ever saw her! I remember eted transylvania and the Jakab family who changed records to hide us in their family. The family that is in the Hungarian parliament and is the director of the world health organization. I remember car caravans coming for us, and my younger sister was taken by Hungarian persons to Hungary, another to the US, and I was laundered and hurt for many more years since I was older, so I would not remember things. Another Jewish kid was harassed to death in Gyergyo Transylvania and they used that memory to get me through London to the US. I remember the US consulate and strange stuff and being disclosed that I was Jewish. I remember now when they printed me my birth certificate! I remember setting off many alarms everyone despite them trying so hard and hurting me and other kids to make us forget those things! I remember hordes of adult men being chased in creek beds while people were throwing rocks at them,and I now know that they were the parents of those kids! Human trafficking in mass for genetic engineering and etc. I now remember telling german, british and french aid workers of those things and people going and digging up places. I remember being taken to the FBI after coming to the US. I was genetics tested and they found I have different genetics! Recently I began inquiring about things even through the Hungarian embassy and shortly after a supposed cousin of mine who was working here mysteriously died! Given what I remember, he was also bread from Jews for science, and families were killed and hurt for them! Despite me speaking of places in Transylvania Romania, they were overwhelmingly Hungarian and everyone I spoke with and knew were Hungarian. Now, I had children in the US while being mysteriously ill myself, and now they are taken from me, as we well. I have not seen them in 8 months! This, after I also was pushed into working at a government run scientific facility! This is the story of Klausenburg, using Jewish families there to bring their relatives to visit, trapping them, and forcing children to take from them! Then, covering it up by claiming that they were planning to overthrown the government, accused of being foreign agents, and imprisoning them and killing them! This took place in the 80's. No one sells jewish kids like these people! Every angle is thought of! Myself and another kid were separated from the rest of the orphanage, and Hungarian kids harassed and abused him until he died! This is how they were able to get me to not talk about money, hurting my family, Andre Citroen being a relative at Heathrow airport in London. I'm still bring human trafficked! I suppose if they are in the Hungarian parliament, they have all the resources one would ever need! And, yes I do have my PhD and I was making discoveries and filing patents on inventions! Right up until my kids were taken, after a man began coming to my home and claiming security clearance stuff. They got kids from me in the first place by making me sick! My friend's and my intelligences were measured in gyergyo before he died, in a strange way and then they abused us to cover it up! My family must have been hurt in around 1986, my sister was taken to Hungary around 87, my other sister to Texas in 1991, and I was adopted through holt international in 1995. It's etched in my mind forever, the memory of a conversation I over heard when I was just about 6. "But, what if they had no family to claim them and they ended up being orphans, then what?" Iconic building, great scientists (who are sometimes getting lost in the labyrinth of politics), world class scientific results. Thank you. Not somewhere that I've been in, but definitely a grand an impressive building from the outside, it's worth a visit for that alone. After viewing we crossed the Széchenyi Chain Bridge which whilst on it offers great views along the bank of the Danube to the side of the building. This is a beautiful neo-Renassiance mansion by the river.